Wild turkey are the largest game birds in North America. They have been recently re-introduced by the Utah Division of Wildlife Resources into many parts of Utah. Well known for their acute senses, these birds thrive in open forests. 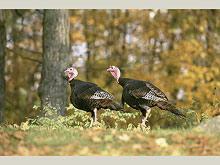 The distinctive gobble of the male can be heard for great distances. Located all along the forests of the National Scenic byway, they are frequently spotted in Sheep Creek, Little Hole and the Cedar Springs area. Thank you for visiting http://www.flaminggorgecountry.com/Wild-Turkey! Be sure and revisit flaminggorgecountry.com frequently for content updates and more.